Solid results, a healthy long-term outlook, and massive buybacks? Easily forgotten when the next quarter's sales will come in a little softer than expected. 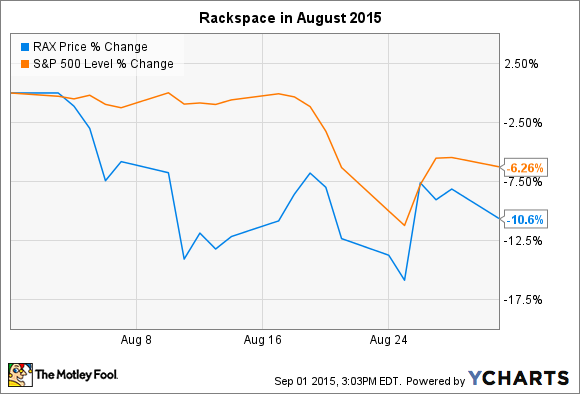 What: Shares of Rackspace Hosting (NYSE:RAX) fell 10.6% in August, according to data from S&P Capital IQ. Near the middle of the month, the cloud computing veteran posted solid second-quarter results, but followed up with weak guidance for the third quarter. The next day, Rackspace shares fell 12%. The data center racks where the proverbial doughnuts are made. Source: Rackspace. So what: In the second quarter, Rackspace held earnings steady year over year at $0.20 per share, in line with analyst expectations. On the top line, sales increased 11% to $489 million but your average analyst was looking for $491 million. So far, so good. But for the third quarter, management set revenue targets far below analyst projections. That's where the panic sales started. Now what: Rackspace now expects to hit sequential sales growth of roughly 3% in both the third and fourth quarters, which works out to approximately $503 million in the current quarter and $517 million to finish out the fiscal year. Analysts had been targeting $511 million and $459 million, respectively. In other words, Rackspace is pushing a large volume of expected sales from the third quarter to the fourth. The company also kicked off a $1 billion share buyback program, to be completed over the next two years. That's a generous policy, considering that Rackspace's market cap stops at just $4.3 billion today. But investors pushed this value-packed announcement and strong fourth-quarter revenue targets aside to focus on slow third-quarter sales instead. Rackspace has nearly doubled its revenues, earnings, and free cash flows over the last four years. Meanwhile, share prices have fallen 17%. Investors are nervous about cutthroat competition in the cloud computing sector, and those fears helped to pull the stock down again in August. There is substance behind those fears, but only if Rackspace's rivals start pulling out the stops in their price wars faster than before. Pricing pressure has been a constant source of pressure for years, and yet the company continues to deliver market-leading sales and profits. Call me biased since I own shares of the company, but months like these only make Rackspace look like an even better buy in my opinion. I'm holding on to my position for the long haul, patiently waiting for Mr. Market to come to his senses.